In our Scratch Programming for Kids - Part 1 and Scratch Programming for Kids - Part 2,we have seen how to create a simple Scratch program which responds to our computer keyboard keys. Now, using the same principle we are going to use a innovative arduino keyboard MaKey MaKey which can turn everyday objects such as banana, modelling clay, coins and anything that is conductive in nature into touch pads responding to touch. There are various projects to do with MaKey MaKey and one such project is to create a new musical instrument that combines the use of Scratch and a MaKey MaKey together. This will serve as a great introduction to programming and arduino which will encourage kids to come up with their own interesting projects. 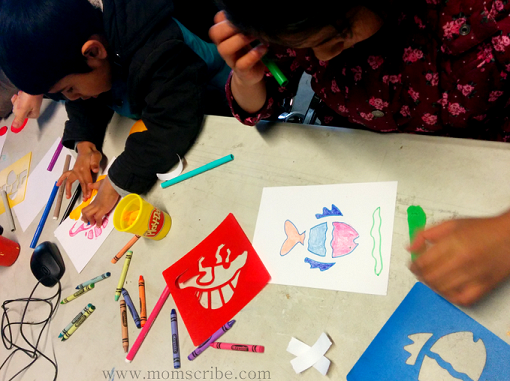 Encourage kids to draw animals using stencils and ask them to colour using crayons. 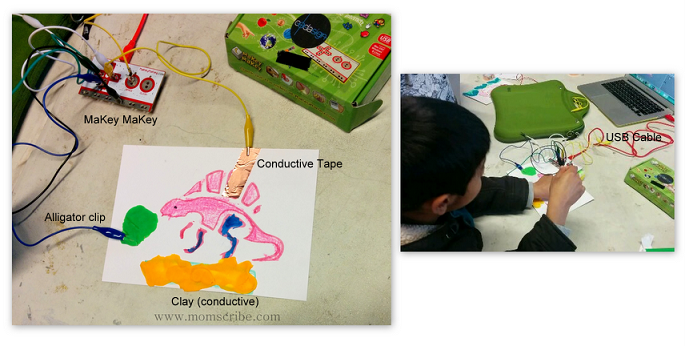 Then using some conductive materials like modelling clay and conductive tape, let them decorate and stick as per they wish for their design to react. Connect one end of the USB cable to MaKey MaKey and the other end is connected to the computer. 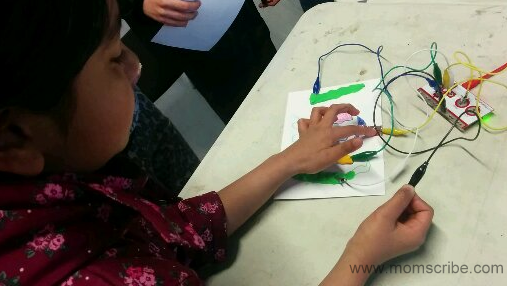 Next, connect the alligator clips with one end touching the conductive objects on the design and the other end to the respective keys on the MaKey MaKey board. Note that the black alligator clip is connected to the Earth by holding it on one hand. Finally, start playing your new musical instrument. You can notice that for every touch on the object, the corresponding note on the Scratch programming starts to sound. This is because MaKey MaKey has taken the role of your computer keyboard for which we have assigned sounds through our scratch programming in our last post and now, responds to its every touch such as arrow keys and space bar (see below video for final output). You can browse and go to https://scratch.mit.edu/ and join scratch community by creating an online account. You can also download scratch for offline use. Take time to explore more interesting and innovative Scratch projects by kids. If you liked the post, do subscribe to this blog. Till then, see you next week with more interesting kid's wearable technology.